Unraveled Ravel Is A Revelation : 13.7: Cosmos And Culture Anri Sala's installation at the Venice Biennale explores music, the body, technology, gender and the making of art. Alva Noë says the three-part work is a delightful puzzle, with all the pieces coming together in the end to envelop the audience in a story that is bigger than the sum of its parts. A visitor takes in Anri Sala's Ravel Ravel Unravel installation in the French pavilion of the 55th Venice Biennale. Sometimes art leaves things as they are and gives you an opportunity to notice; we saw last week that this was the case with Robert Irwin's show at the Whitney. And sometimes art bangs you over the head with new experiences. Richard Serra's work is an example of this. Then there are the times it does both at the same time. This is the case with Anri Sala's strong and loud — but, also, cool and understated — installation entitled Ravel Ravel Unravel now up in the French Pavilion at the Venice Biennale. In the first room of the installation you encounter a film of a woman; the shot is close and you can only see her face. She appears to be making music, which we can hear; or is she only listening to music? From her face, and head, you can tell that her whole body is engaged with the music, which is Ravel's famous piano concerto for the left hand. She can't be performing it. It doesn't feel like there's an orchestra present. But, from her upper body, it looks like she could be playing piano. The music occasionally speeds up, or slows down, as if a DJ were speeding up the turn table. This first room of the exhibit is puzzling. Room two is loud and thrilling. Two films are projected on the wall. 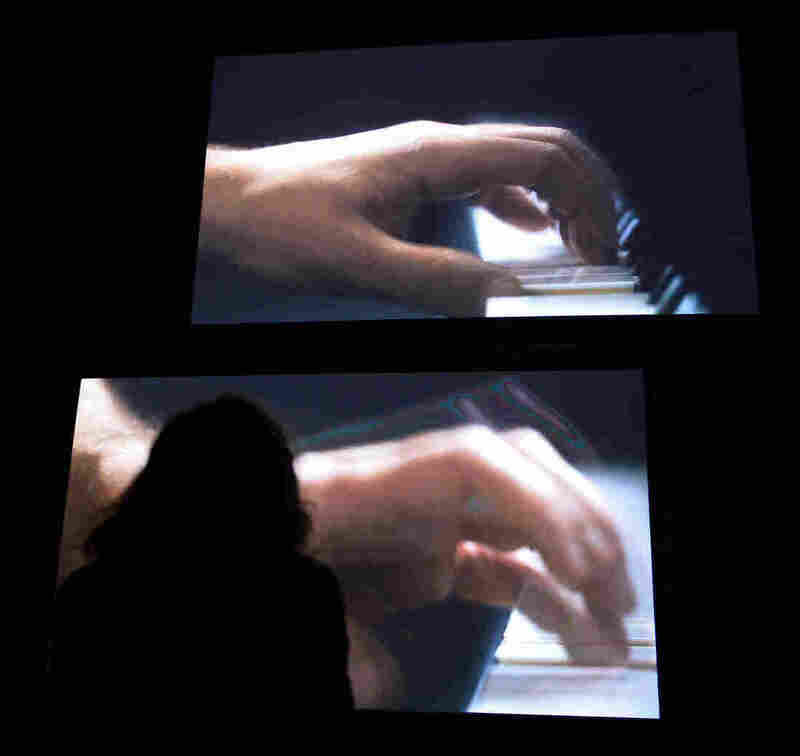 Each shows the (hairy, manly, big) left hand of a pianist as he performs the Ravel concerto live with an orchestra. But each film shows a different soloist. Even though the musical score is the same — indeed, the two recordings were made with the same orchestra and conductor — the soloists make different choices, have different timing. The result is a luscious cacophony, layers of dissonance, and the occasional, delightful, coming together of the two versions. As art critic Blake Gopnik has remarked, it it surprising how good it sounds to hear the Ravel played twice differently at the same time. There is another element as well: as we had seen a close up of the woman's face in the first room, now what we see are close ups of the two left hands as they play. I was reminded of an old Sesame Street routine from my childhood in which a hand is treated as a puppet; sometimes the hand looked sad, but it could also look cheerful or satisfied. I loved that routine. And so here: you felt, watching the two left hands racing along the keyboards, as if were you watching two complete beings, two whole intelligences. Ravel wrote this piece for Paul Wittgenstein, a noted pianist who had lost his right arm in World War I. The piece is composed for a person with an incomplete body. But here the left hands show up, no less than the face of the woman in the first room, as complete, as whole, as expressions of the complete and whole person. Paul Wittgenstein happens to have been the brother of Ludwig Wittgenstein, one of the most inventive and important philosophers of the 20th century. A central theme in Wittgenstein's writing is the connection between our "inner" lives of feeling and thought and our "outer" lives of movement and the body. These are not two distinct domains, thought Wittgenstein. A person is not a mind trapped in a body, but rather a living human being. Rooms one and two have been about Ravel unraveled, as the shows title would have it. Room three is about putting it back together. In the film here, we now have a proper view of the woman and see that she is stationed at a mixing table and two turntables; she is mixing the two separate recordings, blending them, as best she can, as one. She slows one turntable down, races another forward. She orchestrates. She creates. The sun blasts into the clean white room behind her — in the very gallery where the films are now shown in Venice — and, as the music soars, she herself glows with an almost divine creative presence. Art making: the power to make song, or to make art about the making of song. But what's going on here is more than that. Sala has contrived to have a woman take two gorgeous renderings of music written by a Romantic French composer for a one-armed brother of a philosopher and ravel them together into a new piece of music. Technology is the final abiding theme in this work of art. Technology extends us, as with the passage of meaning from the hand to the piano keyboard to the laptop and the mixing deck. Technology extends what we can do and what we are. And technology allowed the lady at the turntables, the two keyboardists, an orchestra, Ravel, and all of us sitting there in Venice in rapt attention, to make something altogether new.